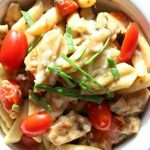 Penne pasta, bites of chicken, halved grape tomatoes, balsamic vinegar, fresh basil and mozzarella all come together in a simple but totally flavorful one pot meal. You won’t be able to stop eating this one! Pour pasta into the bottom of your instant pot. Add in the chicken broth. Try to cover most of the pasta with the chicken broth. Pour in the olive oil. Place chicken pieces on top. Salt and pepper the chicken. Cover the pot and secure the lid. Make sure valve is set to “sealing.” Set the manual button or pressure cook button (depending on your instant pot model) to 3 minutes for al dente pasta and 4 minute for pasta that is a little more soft. Let the pressure release naturally for 5 minutes and then release the rest of the pressure by moving the valve to venting. Remove the lid. Turn the pot to the saute setting. Stir in the vinegar, basil, tomatoes and cheese. When cheese is melted turn the pot to the keep warm setting. Serve the pasta as soon as possible and enjoy! Stovetop Directions: I don’t have a slow cooker version of this recipe because I don’t love how pasta turns out in the slow cooker. You could however make this on your stovetop. Here are the directions: Cook the chicken in the olive oil in a pan. Salt and pepper. Set aside. In a large pot cook pasta according to the package directions. Drain off the water. Reserve 1/4 cup of the pasta water. Return pasta back into the pot. Toss in reserved pasta water. Stir in the chicken, vinegar, basil, tomatoes and cheese. Let the cheese melt. Serve immediately.